Pegasus Profiles carry out HiDef plasma cutting of carbon steel and stainless steel using the latest high definition plasma cutting machines. 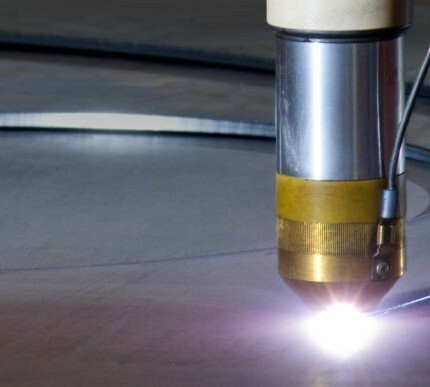 The Pegasus Profiles HiDef Plasma cutters produce large quantities of highly accurate components up to 30mm thick, from plates up to 8000mm x 3000mm, at extremely competitive prices. Our latest machines now include the revolutionary ‘True Hole’ technology for virtually taper free holes in mild steel. 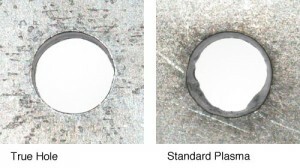 True Hole® technology for mild steel produces significantly better hole quality than previously possible using plasma. Crucially, True Hole technology is delivered automatically without operator intervention, to produce unmatched hole quality. One common description of plasma is to describe it as the fourth state of matter. We normally think of the three states of matter as solid, liquid and gas. For a common element – water, these three states are ice, water and steam. The difference between these states relates to their energy levels. When we add energy in the form of heat to ice, the ice melts and forms water. When we add more energy, the water vaporizes into hydrogen and oxygen, in the form of steam. By adding more energy to steam these gases become ionized. This ionization process causes the gas to become electrically conductive. This is called a plasma. 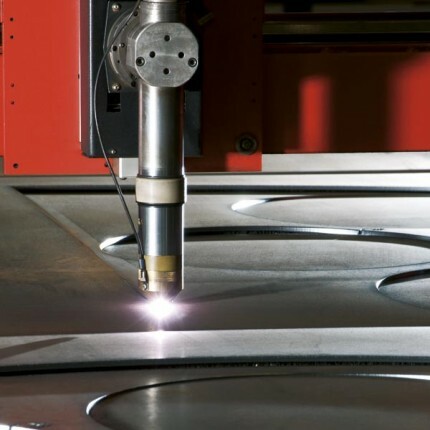 The plasma cutting process, as used in the cutting of electrically conductive metals, uses this electrically conductive gas to transfer energy from an electrical power source through a plasma cutting torch to the material being cut. The basic plasma arc cutting system consists of a power supply, an arc starting circuit and a torch. These system components provide the electrical energy, ionization capability, and process control, that is necessary to produce high quality, highly productive cuts on a variety of different materials.